The perfect way to serve leftover chili. The perfect way to serve leftover chili. * We like sweet potato fries! We used Chili Con Carne in this recipe, but you can choose your favorite recipe. Spread the fries on a baking sheet in a single layer and bake for 8 minutes. Meanwhile, reheat the chili on the stovetop or in the microwave. Remove the fries from the oven and reduce the oven temperature to 300 degrees. Divide the fries into four oven-safe dishes. 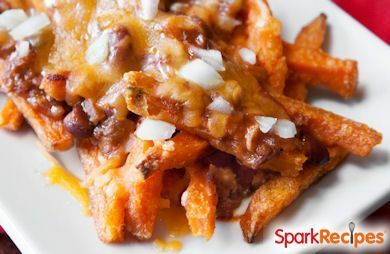 Top each portion with 1/2 cup chili and 2 tablespoons cheese, then bake until the cheese has melted, about 2 minutes. Remove from the oven and sprinkle each portion with one tablespoon onions. Caution: dishes will be hot!